FCI’s innovative AST thermal mass flow technology for the ST80 Flow Meters features an innovative hybrid sensor drive. This patent-pending measuring technique combines, for the first time, both of the industry’s highly proven constant power (CP) and constant temperature (CT) thermal dispersion sensing technologies in the same instrument. Complementing this new measurement drive technique are a choice of four different flow sensor element designs to further ensure best installed performance, including FCI’s new wet gas solution. With no moving parts to plug or foul and clean, the ST80 Flow Meters deliver extensive lifecycle cost savings over higher maintenance technologies. The result is accurate and highly repeatable mass flow measurement at the lowest total installed cost. 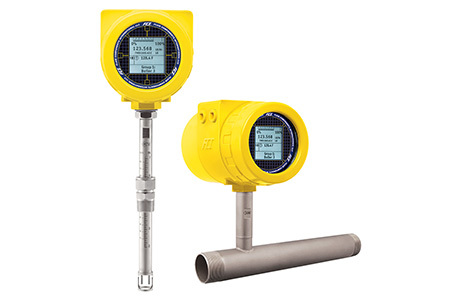 In today’s complex process control schemes, the ST80 meters provide the accurate air and gas flow measurements essential for process consistency, quality, plant safety and environmental compliance. The ST80 Series features multiple outputs to interface with control systems and/or set-up or configuration devices. The standard ST80 meter configuration includes: dual 4-20 mA, NAMUR NE43 compliant analog outputs, HART (version 7) and Modbus 485. Optionally available are: Foundation Fieldbus and PROFIBUS PA. All digital bus communications are full two-way I/O. The easy-to-use ST80 Series is offered in three styles: (1) no display, (2) with display, or (3) with display and through-the-glass user programming buttons. The display is a best-in-class, backlighted information LCD. It provides users with both digital and bar graph readout of the processes flow rate and temperature, totalized flow, alarm conditions, diagnostics feedback and even a user defined label field.